Just like Supplication Sheets, I have been wanting to publish clear, simple and extremely high quality extracts of the Quran for a while now. Just recently though (By the Grace of Allah Almighty), have found a way to create high quality reproductions of the Quran in both popular scripts – Uthmani and Indo/Pak (which is my personal favorite), which has enabled this project to progress, Alhamdulillah. Each Quran Page document will be on one Surah (Chapter). My initial plan is to only work on Surah 1 (Al-Fatiha) and the Surah’s of Juz 30 (Amma), which will inshAllah be released incrementally. As you may have noticed, a Quran Index page has also been created (which can be found in the top menu bar and right side column), where you can keep track of all the Quran Page documents. Uthmani script: Uthmani quran text similar to Medina Mushaf. Note: Though only the Indo/Pak script image will be shown on the actual online Page, pdf’s of both the scripts will be available for download, so please do check these out. Indo/Pak script: Created using the “Quran Publishing System” (QPS), which provides 100% ligature based error free text. This is the very same software that has been used to typeset a number of Quran books. Uthmani script: Taken straight from the King Fahd Glorious Quran Printing Complex. Even the font is exactly the same. Each Quran Page document is on one Surah. One page will be the Arabic text, while the next page will be an English translation. “The Holy Qur’an Part 30: ‘Amma with Modern English Translations (Fourth Edition)”.By Muhammad Shamsul Haque, Ph.D. Namuk International. 1993. The real advantage of Quran Pages is that you don’t need to be connected to the internet to view them. You can download all the documents and view them offline. So I hope you enjoy. Stay tuned … the first Quran Page document is just around the corner. 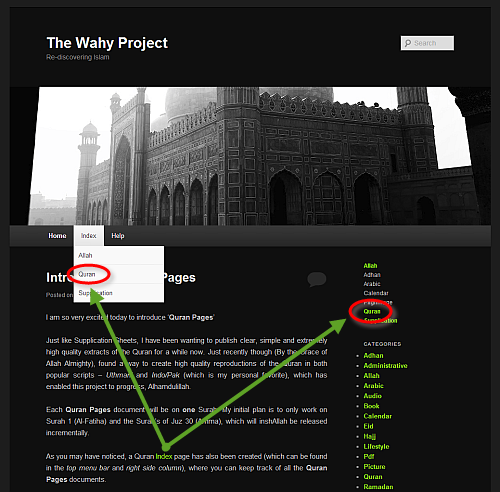 This entry was posted in Quran and tagged Quran, Quran Pages by thewahyproject. Bookmark the permalink.